We are so very fortunate to have such an extensive estuary system offering various types of fishing assessable for land based as-well as boat fisho’s. 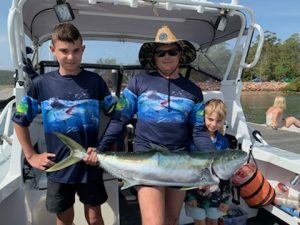 April is when the Bay comes alive with travelling bream & blackfish, kingfish & long tailed tuna, jewfish & flathead with the odd crab thrown in the mix. 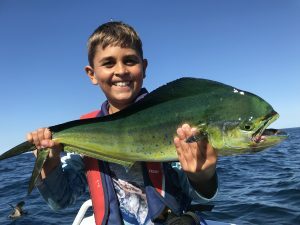 Firstly, for the Junior Duffs going for their first fish check out our kid safe locations; Shoal Bay Wharf, Shoal Bay Beach, Little Beach small wharf, Taylors Beach Wharf & Sally Shores Wharf & Pearson’s Park Wharf. Flathead fisho’s target the Western end of Shoal Bay Beach under Nelson Head working soft plastics/hard bodied lures. White bait on size 4 gang hooks no sinker and slowly retrieved are a gun bait. Also try the boat ramp which is located just East of the Shoal Bay Pub. The advantage of this area is that there is also plenty of water no matter the tide, the sand-based area allows you to use lures without snags. Other species that frequent this area are bream, tarwhine, tailor and sand whiting. The small wharf at Little Beach located at the Southern end produces flathead, bream, blackfish and tailor. Cast towards the Boathouse restaurant wharfs for best results. The longer wharf at Little Beach produces most species including snapper. The Little Beach boat ramp is a great place to target arrow squid in the afternoon into the evening. Nelson Bay Beach is a great stretch of beach to target flathead, especially at the Fly Point end. Just be mindful that the marine park sanctuary ‘no fishing’ zones. Onto the Nelson Bay Breakwall, this is the place to target, bream, perhaps blackfish if they have started, kingfish and jewfish. For kingfish fish the sunrise or sunset with stick baits, poppa’s or whole squid. For jewfish target the change of tide with live slimies or yellowtail. Prawns and fish baits are the way to go for bream. Onto Roywood Reserve, this area is a great place to pump yabbies at low water and as the tide comes back covering the sand banks and yabbie holes the fish are close behind. Target species here are flathead and sand whiting. This is also a great area to target whiting on surface poppa’s on high water. Also, worth a night-time prawning adventure, wear shoes! Fish the sandy areas at high tide with surface poppa’s for whiting and plastics for flathead. Wanda Headland is located West of Salamander Bay just behind the shops at Old Salamander. Good deep water around the rocky headland that produces, bream, tailor, flathead and Jewfish. Moving West towards Soldiers Point behind Bannisters Hotel Sally Shores Wharf offers squid, bream, tailor, salmon, whiting. Approximately, 60-80m from the end of the wharf it drops off into a channel around 40metres deep, this area produces kingfish, Longtail Tuna and Jewfish. Ballooning live baits out here is the way to go. For those that will put the boat in, try Tilligerry Creek for Trumpeter Whiting, flathead and mud crabs. Work the North end of Feninghamms Island along the shoreline for flathead on plastics. Works the Western side of One Tree and Shag Island for Trumpeter Whiting. For Jewfish work the Western side of Middle Island and the Entrance to Fame Cove during the change of tide with live yellowtails or slimies. The wreck at Salamander Bay is also worth a look for Jewfish and flathead. Fish the Middle Ground on the drop-offs for sand whiting. The West Bank produces tailor at this time of year. Drift the main Nelson Bay Breakwall for Kingfish with whole squid, live baits or poppas. If the fish are working the surface then lures are the way to go. Anchor off the main Breakwall or the Northern end Short Wall off the Anchorage and fish the change of the tide for jewfish. If there is a Southerly swell rolling in then fish the Boulders under Yacaaba Headland with fish baits for bream. Drift Jimmies Beach West for flathead and whiting. Try the Short Cut for whiting and flathead. Work Orungall Point to Lower Pindimar for flathead. Drift the rock-wall along Piggy’s Beach for bream on plastics or hard bodies. Into Lobito Point West through to Balberook Cove put your boat onto the sandy Coves and walk the shoreline for flathead on plastics or hard bodies. The Western side of Garden Island under the oyster wracks produces bream and flathead. Work up into the Karuah River in amongst the wracks for bream. Both Bridges produces Jewfish on the change of tide as does the Tea Gadens Bridge. 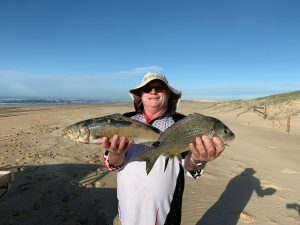 Easter is the time the beaches come alive with sea mullet making their annual run. This triggers bream, tailor, jewfish and sharks all of which like to feed on the poor old mullet. The key open beaches to fish are Fingal, Samurai, One-Mile and Stockton Beaches. Bream are a key target species which will take pipi and mullet baits that will work best during this time of year. A beach worm is always worth a throw as the smaller jewfish love them. This gives you heaps of information – most important all the current reef locations with GPS co-ordinances. So many reefs and spots outside, Broughton Island around The Sisters, Jim’s Leap, North Rock to Cod Rock everything from Long-tail Tuna to Snapper. Out to the FAD for a Dollie or the V or 21 Reefs for snapper or Traglan. Perhaps North to Edith Breaker to work big soft plastics for snapper in the habitat zone. Hope this has been helpful, tight lines!